Ready to travel through time? 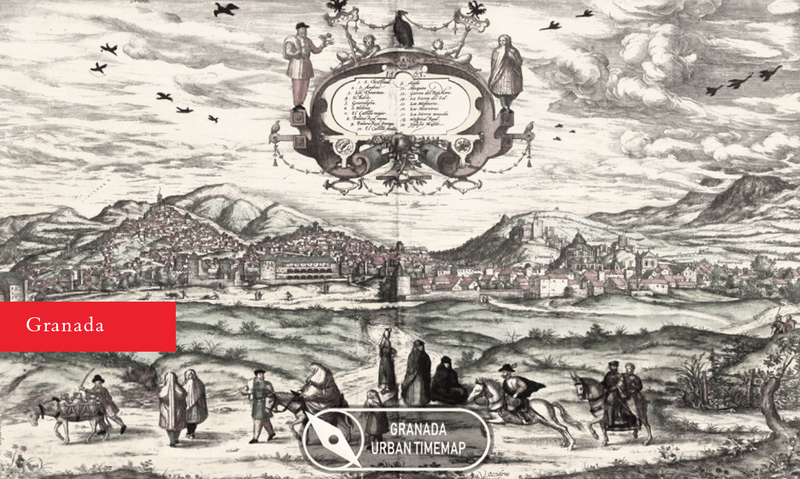 Use the icons of the interactive content to discover the flow of urban history. Scroll under the video to find some interesting facts and information about the city and its landmarks. The model and study of Budapest focuses on the inner city of Pest, specifically the southern area of Pest City which existed as a separate town since the medieval times. The examined area was originally bordered by the city walls which formed a half-circle shape and now this form has been inherited to the present day, being defined by the surrounding ring roads. 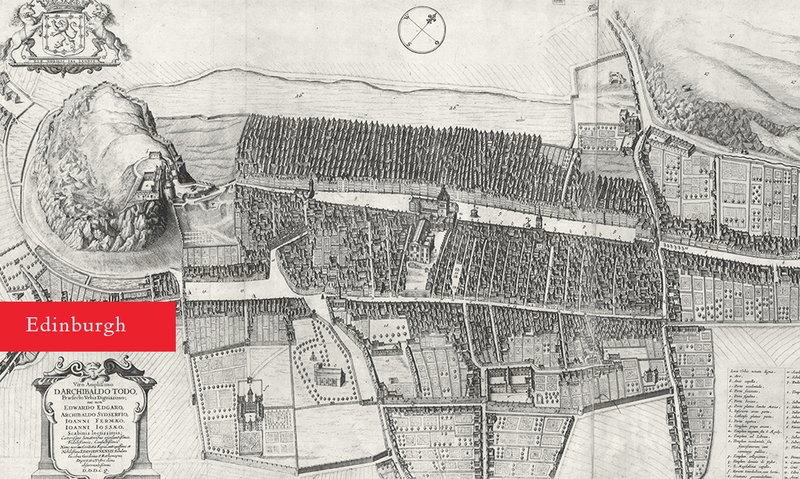 The time periods of the research span more than 1,500 years: from the Roman fortification to the metropolitan city centre of the later capital. 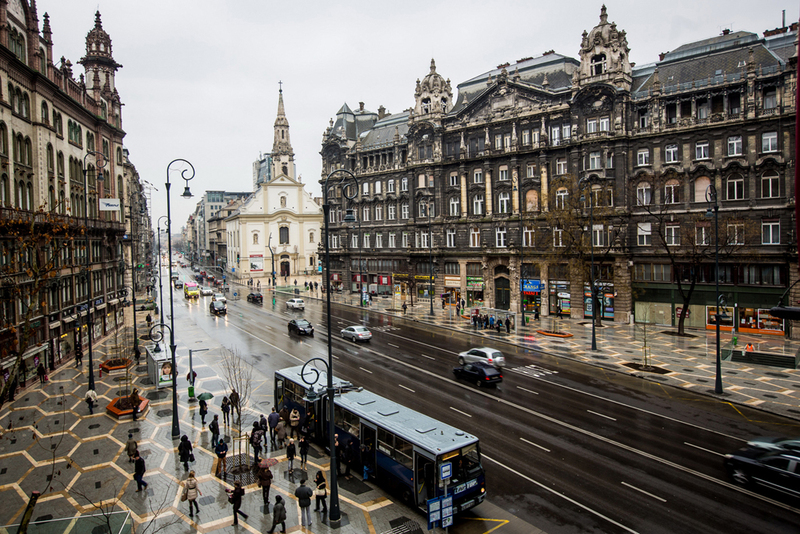 The city evolved from the second half of the 19th century with its strong and wide axis towards the first permanent bridge of this area (Elisabeth Bridge) and with the newly developed urban blocks of Revival and Art Nouveau styles. The locations can be visited on a loop in both directions, while Map view provides possibility to choose directly from these stations (1-5). The selection for Pest City’s time phases tried to capture the most important turning points of the city’s developmental history: each phase chosen represents the apex of one building period before new styles were introduced. The City of Pest still keeps the remains of a Roman fort from the 4th century and upon these former foundation walls a parish church was later erected in Romanesque Style, called the Innercity Parish Church (Church of the Blessed Virgin Mary). Because of this interesting continuity year 350 AD was selected first. Regarding the medieval period the iconic year of 1541 was selected being one of the greatest turning points in Hungarian history. In this year the Ottoman Empire occupied the middle part of the country together with Buda and the city of Pest. For 150 years there had been no developments connected to Hungarian culture, but many of the churches were converted to mosques. When retaking the city from the Turks in 1686, it was nearly completely destroyed by the battle, so the state of 1541 means the end of an era, politically and urbanistically. Starting from the 18th century the city was rebuilt with many new Baroque monuments. From the 19th century the classical style also appeared with the Reform age, the peak of which was the revolution of 1848 against the Habsburg rule. During the battle for Buda in 1849 a lot of buildings were destroyed by the cannon balls shot from the castle towards the Hungarian forces in the city. The revolution failed, but 19 years later the Compromise heralded a new era by forming the Austro-Hungarian Monarchy. In 1873 Budapest was formed from Buda, Óbuda and Pest and became the twin capital of the dual state. As a result the city was completely transfromed and reshaped in the following 50 years, developing new broad avenues and replacing many one- and two-storied houses with buildings of 5 or 6 levels. 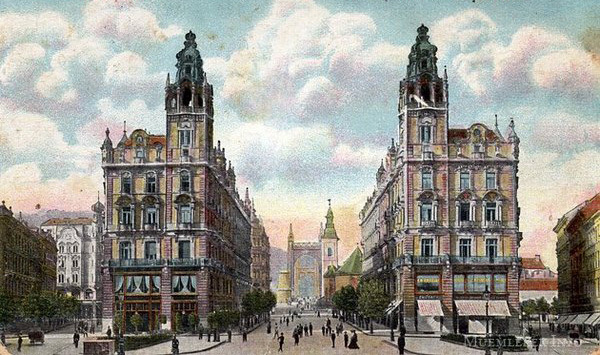 The reigning style of the metropolitan city became Eclecticism (revival styles) continuing with the appearance of Art Nouveau in the early years of the 20th century. With the end of the First World War in 1918 also ended this important era, both politically and culturally. 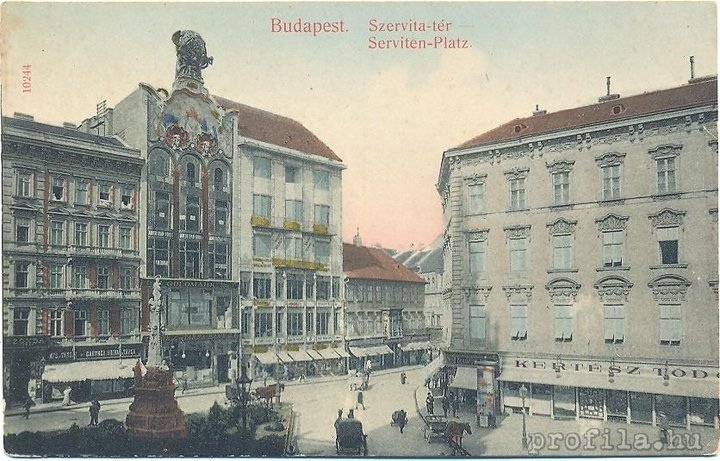 The square in its current form is a novel development (from the turn of the 20th century) as its buildings now occupy the former Városháza (City Hall) and Eskü Squares. It also hosts the remains of a Roman fortress, popularly called Contra Aquincum, which was built around 350 AD on the hostile side of the Limes which was here marked out by the Danube River. Its most important buildings are the Blessed Mary Parish Church, the Piarist Secondary School, the Péterffy Palace (1797), the Elisabeth Bridge (1903) and until 1900 the former City Hall. The late Roman fortress formed an important part of the Pannonian Limes. It was built in the middle of the 4th century AD with walls of more than three metres in depth, with eight U-shaped side towers and four fan-shaped corner towers. The fort was situated on the left bank of the Danube and it could provide unimpeded protection for the ferry connection between the two banks of the river. Inner buildings like lodgins for the military crew, stores or the house of the commander were built against the inner sides of the fortress walls, which provided better defense against attacks from outside. 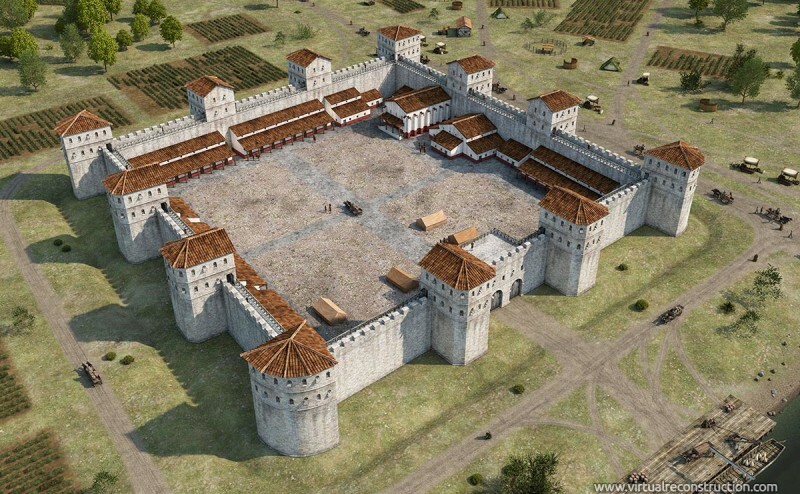 It is very likely that a gate was realised on the western side of the fort, connecting the Danube port with the fortress, and there is also evidence of a ditch with a width of seven metres and depth of three metres that surrounded the complex. The Parish Church of the Blessed Virgin Mary was built on the ruins of Contra Aquincum at the end of the 12th century. The sanctuary of the Romanesque church was demolished in the 14th century and a Gothic type hall church was built in its place. The building was reconstructed and enlarged until it reached its present size at the beginning of the 16th century. During the reclamation of the city from the Turks in 1686, the church was almost totally demolished. Its reconstruction ended in 1741, in a Baroque style outside and inside, but preserving its Gothic santuary. In 1895 the idea of demolishing or moving the church came up in connection with the construction of the Elisabeth Bridge. Fortunately it was not realised, so the listed building could remain in its original place. The first known form of Pest city’s town hall is from as late as 1710, after the liberation of the city from nearly 150 years of Turkish rule. 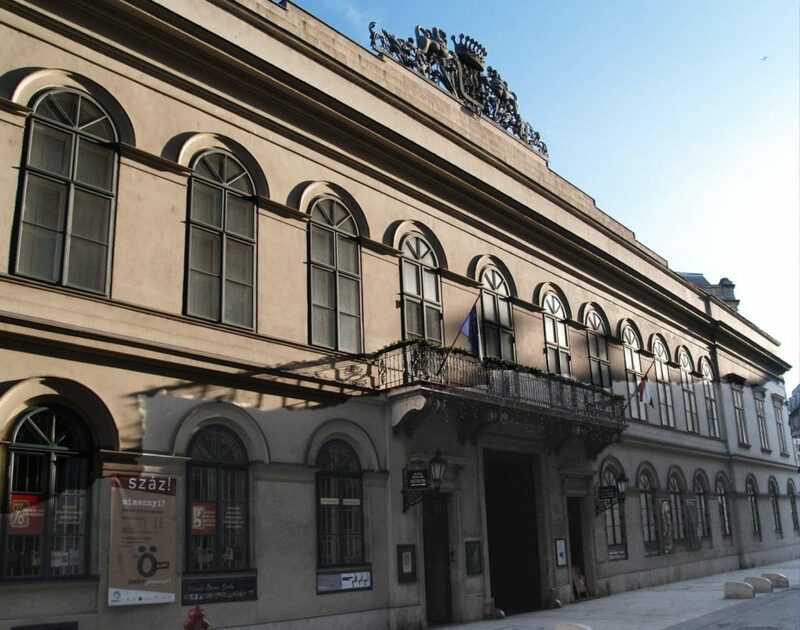 The two-storey building was heavily destroyed by the great flood of the Danube in 1838 and so a new three-storey high version was built in 1842, following the plans of József Hild, one of the most famous architects of the Hungarian Classicist period. 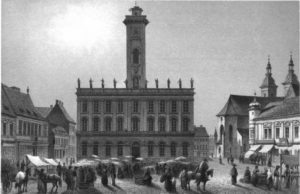 He was also commissioned in 1863 with the extension of the building with a further storey, but soon after it turned out that the building did not fit into the new masterplans of Pest City and it was finally demolished in 1900, giving space to the new boulevard of the new capital, the current Kossuth Street. Péterffy Palace (Krist House) was built in 1755 and since 1831 it has hosted the Százéves (100 year-old) Restaurant. 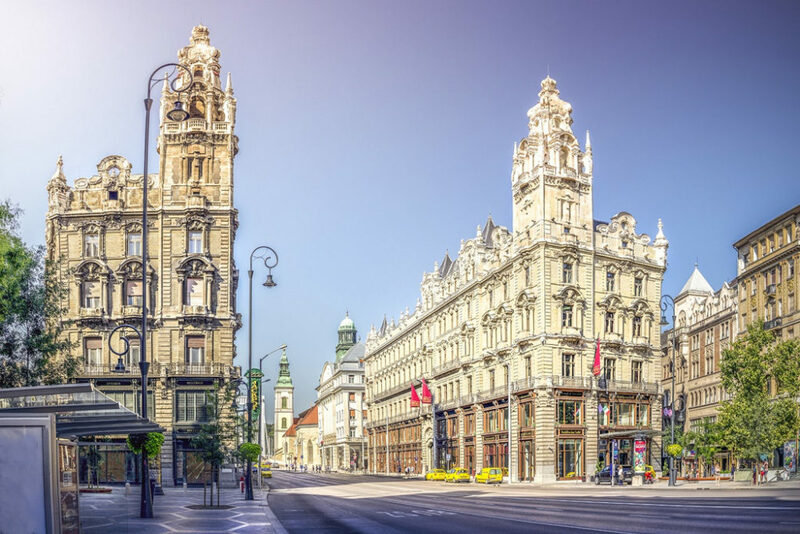 It was built by the architect András Mayerhoffer, who also designed the Grassalkovich Palace of very similar appearance just a few streets away from here. This other building – together with a lot of other Baroque palaces in the neighbourhood – was the victim of the construction works for erecting the Elisabeth Bridge at the end of the 19th century. Therefore Péterffy Palace is now the only not-ecclasial building of Pest, which was preserved in its original Baroque style. 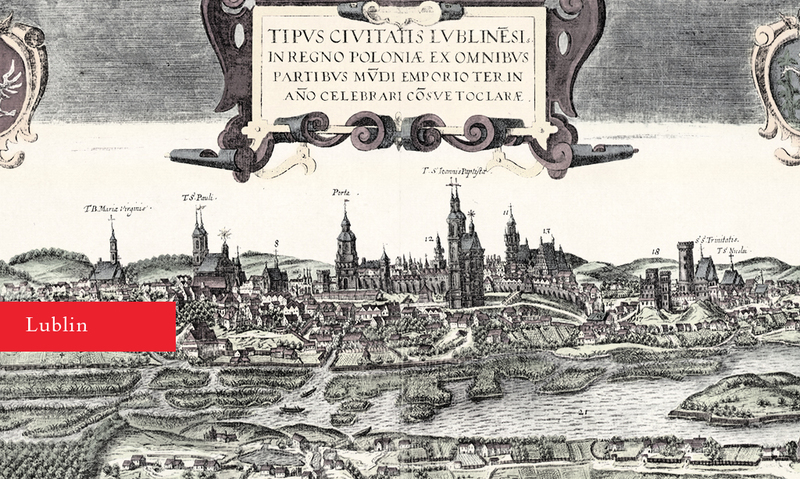 On the first real map of Pest City from 1758, Szerb (Serbian) Street is mentioned as Pálos Street, referring to the plot bought by the Pauline Order in the eastern end of the street. As this map also shows the ethnic origin of the inhabitants, it can be clearly seen that many Serbian families had settled down in this part of the city during the Turkish rule and as a result of this they acquired and rebuilt a church for their Orthodox faith here. As the Pauline Order was disincorporated by the end of the 18th century, the Pálos name soon became obsolate to use by the citizens. 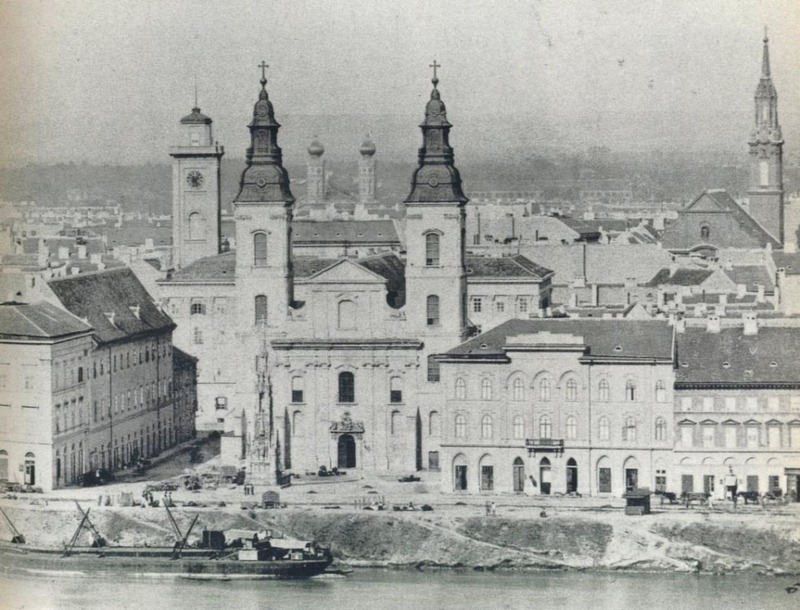 Dominicans settled down in Pest around 1230 and founded a monastery for St Anthony in the southern side of the city. It is only thought, however, that their cloister could stand on the place of the current St George Church. The monks left the town during the period of the Ottoman rule and the church was then used by Serbian citizens. As the city suffered great damages during the battle for the city in 1686, it was rebuilt as an Orthodox church by 1689 in Baroque style, naming it after St George. 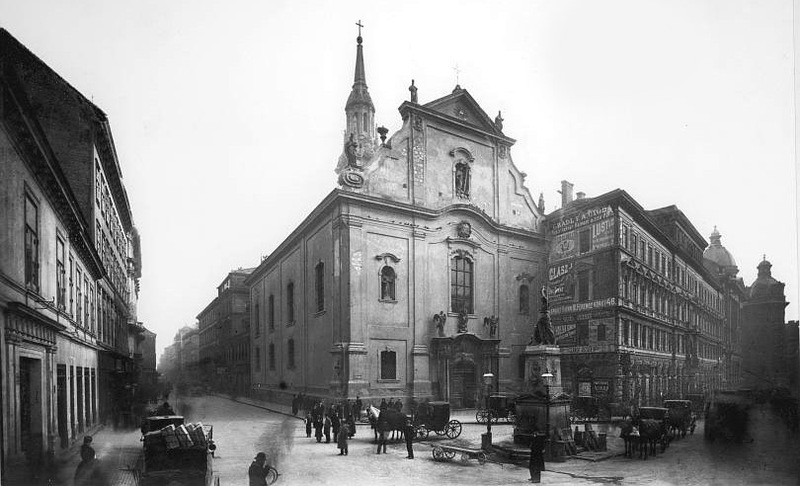 In 1731 the church was demolished and it was rebuilt again by the architect András Mayerhoffer. Egyetem Square was originally just a wider segment of the Úri Street that crossed the city from the Kecskeméti Gate to Budai (Váczi) Gate. Its current name refers to the ELTE University, the predecessor of which was moved to here at the end of the 18th century. 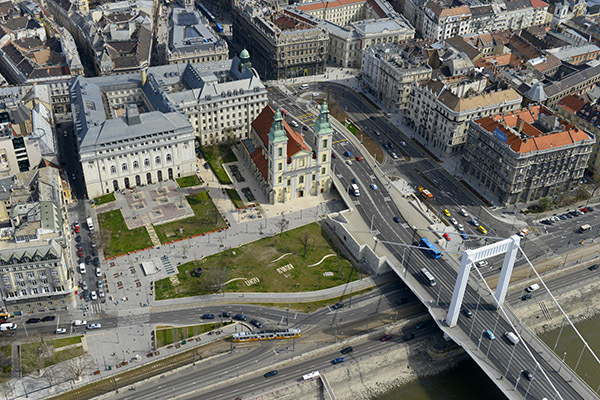 The square can be identified by the University Church, the main building of the ELTE University and the Károlyi Palace. In 1686, the Order of Saint Paul the First Hermit bought the area of the former mosque and some neighbouring houses after the expulsion of the Turks. 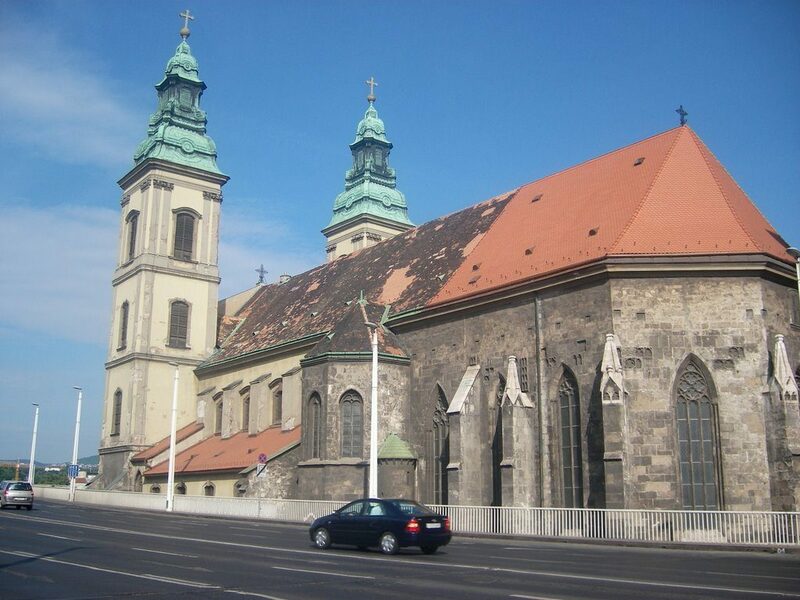 The Hungarian-founded order started building its own church in 1723. The architect of the new building is thought to be András Mayerhoffer, one of the greatest figures of Hungarian Baroque architecture. The monastery was built between 1715 and 1744. After the disincorporation of the Pauline Order by Joseph II Habsburg emperor in 1786, the church was gained by the predecessor of ELTE university. Károlyi Palace is amongst the most important Classicist buildings of Budapest, which has been hosting the Petőfi Literature Museum for 60 years. Current form of the palace was built by György Károlyi in the 1830’s. The plot of almost 3 acre provided a good opportunity to create an urban palace fitting into the city landscape while combining it with the imposing image of a rural castle. The court was put into shape as a closed Baroque French garden, but now it operates as an open park of the urban space. [/caption]Károlyi Palace is among the most important Classicist buildings in Budapest, housing the Petőfi Literature Museum for sixty years. The current form of the palace was built by György Károlyi in the 1830’s. The plot of almost three acres provided a good opportunity to create an urban palace fitting into the city landscape while combining it with the imposing image of a rural castle. The courtyard was shaped as a closed Baroque French garden, but now it operates as an open park of the urban space. Ferenciek Square was named after the Franciscan Church and Monastery that has been standing on its eastern side for more than seven centuries. The name and current use however is a novel feature. Originally – similarly to Egyetem Square – it was only a wider segment of the Úri Street, while the perpendicular road was called Hatvani Street. 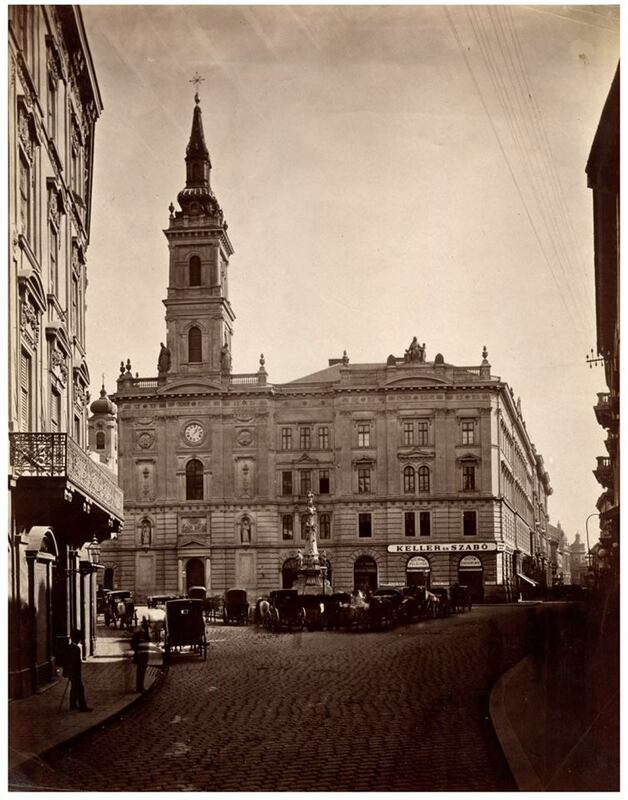 After the redevelopment processes the newly formed square on the axis of the Hatvani Street which is now defined by the Klotild Palaces, the Brudern House and the Royal Tenement House was named after count Apponyi. Nowadays Ferenciek name refers to both the place in front of the church and the wider open space of the main Boulevard (Kossuth Street). 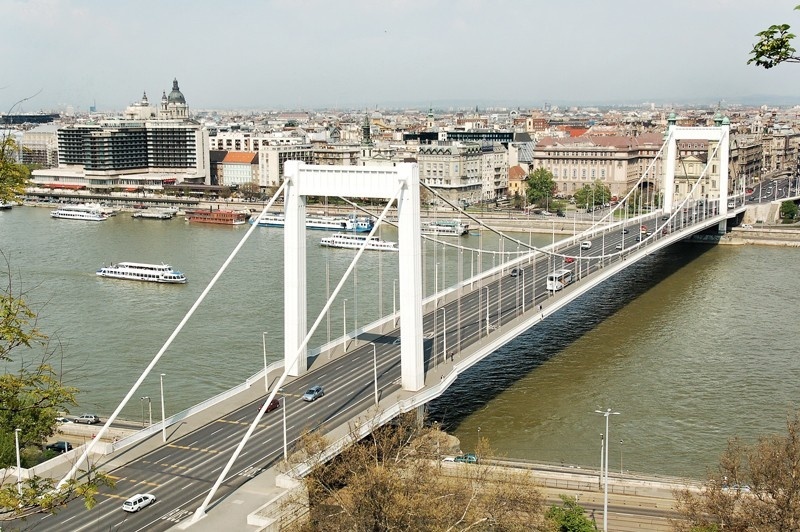 The two Neobaroque buildings designed by Flóris Korb and Kálmán Giergl, built between 1899 and 1902 form an iconic gate for the urban axis defined by the Elisabeth Bridge and Kossuth Street. The development of this boulevard required the demolition of complete urban blocks within the heart of the city and also the rearrangement of the street network. The empty plot was bought by Princess Marie Clotilde, wife of Archduke Joseph Karl of Austria to develop the palaces. The spires of the mirrored towers of the two buildings formed the shape of her husband’s crown. 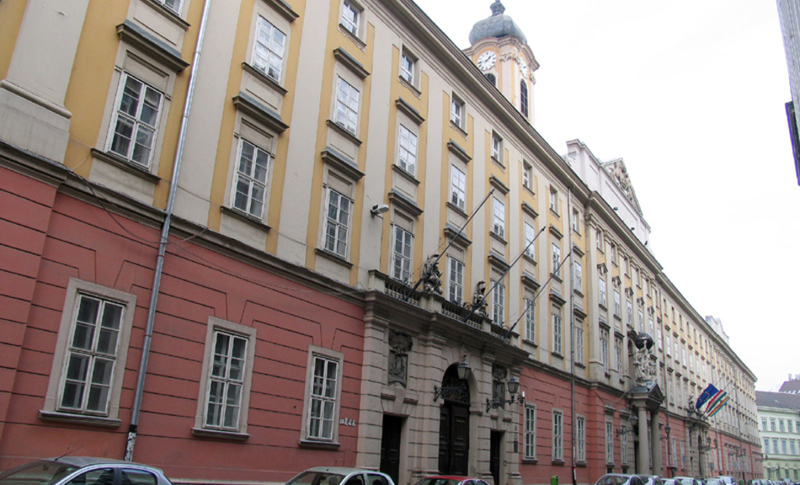 The Royal Tenement House was built by the Habsburg Family through a royal fund company in 1897. 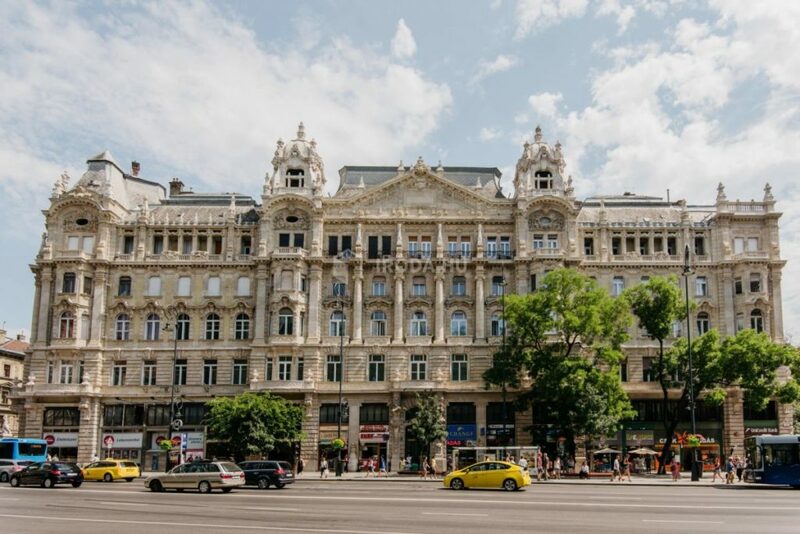 The five-storey building of late Eclectic (Revival) Style with Art Nouveau decorations were designed by the same architects as the Klotild Palaces: Flóris Korb and Kálmán Giergl. 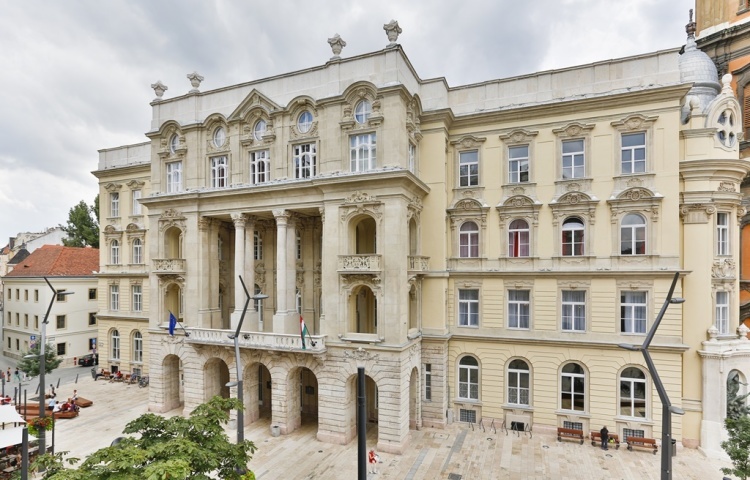 For the realisation of the building, three former houses were demolished including the building of the Hungarian Supreme Court, which had been just redesigned for this purpose in 1869. Franciscans settled down in the eastern part of the city in the second half of the 13th century. Their cloister is thought to have been built around 1270. The monastery of the mendicant order protected the private life of the monks, however, their church was open to everyone. It was also a place for national assemblies on a number of occasions. After 1541, the building functioned as a mosque under the name of Sinan Bey, and could only contiune as a Catholic church after the expulsion of the Turks in 1686. In 1741 both the church and the monastery was rebuilt in the Baroque Style. Szervita Square is quite a new formation of Pest’s urban space. The Servite Order bought several plots in the area after retaking the city from the Turks. The centre of the square was also a building plot originally, but the city only allowed the acquisition if the order would never sell it nor would they build anything to there. In agreement with this, t was only the Baroque Mary statue that was placed to here by the Order, which is still one of the main features of the triangular square. The Servites settled down in the location of current Szervita Square in 1689 using the former Büjük mosque in the first period. Their Baroque church was built in 1732, while the cloister surrounding the two-storey, closed courtyard was only finished by 1772. 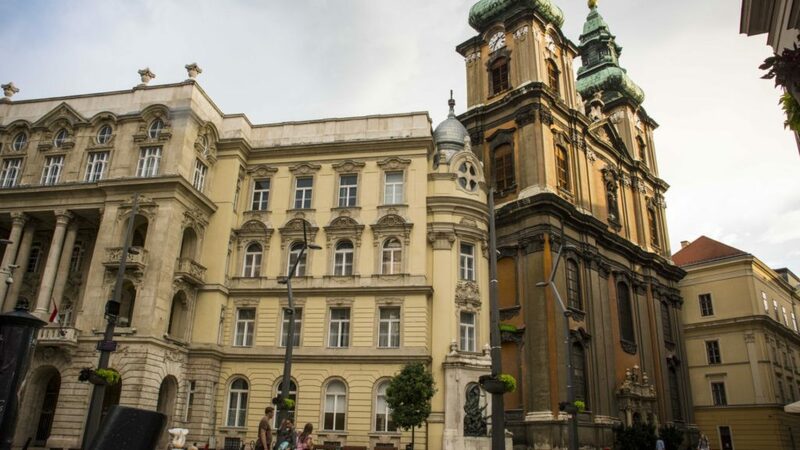 Both buildings suffered serious damage in 1849 by canonfire from Buda Castle, shot by the defending Habsburg troops. The cloister was completely rebuilt between 1871-74 by József Diescher who designed a unified facade, levelling the eaves and other lines with that of the church. By 1976 a modern office building appeared on the western side of the church in the location of the former cloister which was heavily damaged during the Second World War. Török Bank House is a great example of Art Nouveau style in Budapest. It was designed by Henrik Böhm and Ármin Hegedűs in 1906. With great glass surfaces, the facade of the building was a symbol of modernism, while its mosaic decorated gable wall made by Miksa Róth depicts great figures of Hungarian history, with the Patrona Hungariae (protector of Hungary) and the Virgin Mary in the centre of the image. The building had been coronated by a statue of Atlas holding a lighting globe until it was destroyed during the Second World War. Rózsavölgyi House was built in 1912 by the Leitersdorfer Tailors. 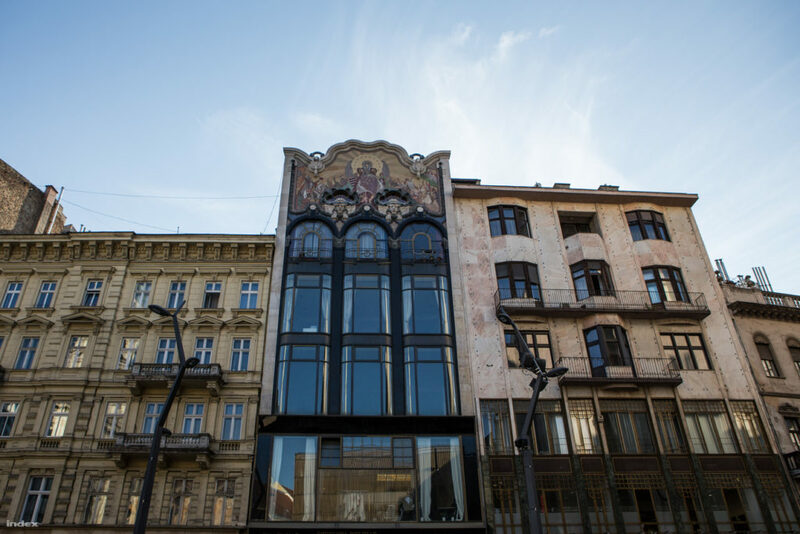 It was designed to be mixed-use, reflected in the design of the main facade: the lower shops had a great glass-surfaced facade, while the upper floors of tenements are hidden by a more enclosed design. Despite this duality, the facade is organised as a unified structure by the bold horizontality of the facade elements. The building was originally built as a residence for the 4,000 crippled soldiers of the Turkish wars which liberated Hungary from the Ottoman rule in the last decades of the 17th century. The plan was to build a rectangular block of four great courtyards with a cross-shaped building in the centre. 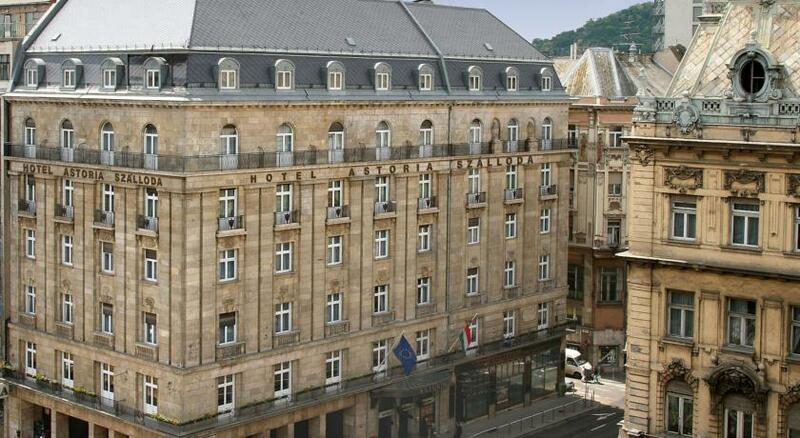 The first side of the Baroque building was only finished in 1747 under the coordination of Anton Erhard Martinelli. The invalids were later moved to Nagyszombat (Trnava) and the still unfinished block became a barracks. In 1894 the city bought the building to create a new city hall to replace the old one which was due to completly demolished by 1900. The city was surrounded by a 10-metre high battlemented wall, which was distributed by three gates and eight towers of different sizes and forms. The gates received their names after the directions of the outgoing roads: Gate of Kecskemét, Hatvan, Gand Vác (or Bécs – Vienna) and also the streets running through these gates were named after the main destinations: Cegléd, Hatvan and Vienna Streets. Towards the Danube there weren’t any fortifications, however city walls were surrounded by a dry ditch of three metres deep and 5 metres wide. Today, only a few parts of the medieval city walls can be found, often as the basement for tenement buildings which were built on the two sides of the late city walls. Which city has also a parish church? and how they were modeled?